If you have ever read any of the other sewing related posts that I have shared than you know that I am not a sewer. I would love to be, but I shy away from most sewing projects. So when I say a project is something I could pull off, you should take that as a sign that it is easy. Really easy. Like sew a straight line that doesn't even really have to be straight easy. 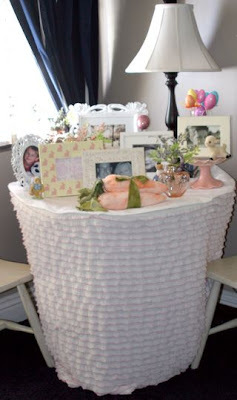 Now you will look at this pretty ruffled tablecloth from All the Small Things and think I am crazy, but I really could pull it off. Check out the tutorial HERE, I bet you can pull it off too! I need some of that ruffled fabric. I've seen it being used for all sorts of darling things.